Despite the various appeals, Hukamnamas, and Gurmattas issued by Sri Akal Takht Sahib, and the warnings by virtually all Panthic organizations, the rabid Ragi Darsan Sinh, does not seem to be toning down his venomous rhetoric against the sacred banis of Sri Dasam Granth Sahib. His latest folly included a stint in Germany, Ireland and the UK, where he was met with resistance by the Sangat that has lost most respect for the aging, mostly wheel-chair bound heretic they now denounce as a "traitor" and a RAW agent (India’s clandestine Research Analysis Wing Agency). Various Hukamnamas and Gurmattas from Sri Akal Takht Sahib have demanded that all Sikh organizations and institutions, including specifically Ragi Darshan Sinh, not to stir up un-necessary controversy in regards to Sri Dasam Granth Sahib from any public stage or medium. Yet, the contemptuous Ragi, who has lived off the Sikh Sangat’s donations his entire life, is now working hand-in-hand with followers of other ex-communicated heretics, such as Gurbakhsh Kala-Afghana, and Joginder Sawney (Rozana Spokesman). Giani Iqbal Singh, Takht Sri Patna Sahib Jathedar who had earlier declared Ragi a 'pakka tankhayai', and the other Jathedars, have shown extensive restraint so far--mainly due to the upcoming Gurta-Gaddi celebrations. It seems that the Ragi has interpreted the silence of Sikh bodies as a nod to accelerate his anti-Panthic propaganda. Not too long ago in Delhi, when the Jagitri procession connected to the Gurta-Gaddi celebrations was passing through New Delhi, Ragi quickly boarded a plane to Delhi and donned a ridiculous black cloak and vowed to wear it until the Sikh Nation rejected the idea that Sri Dasam Granth was the Bani of Guru Gobind Singh Ji. His absurd actions and words are not only misleading the innocent public, but have seemed to attract some so-called Sikh leaders who are ignorant about Gurmat and Sikh history in general. This fact became evident during the Ragi’s recent tour of Germany where he was honored by deluded representatives of Dal Khalsa, Babbar Khalsa, Student Federations, AKJ and some Akali Dal factions. Last week, when Ragi visted Germany under the guise of celebrating the upcoming 300th anniversary of Sri Guru Granth Sahib Ji, he misled several such ignorant, self-serving leaders and Gurdwara committee members using the absurd claim that the RSS was stirring up an enormous "conspiracy" with the aim of replacing Sri Guru Granth Sahib Ji with Sri Dasam Granth and declaring the latter as the "Guru" of the Sikhs. Due to his hateful attacks on Sri Dasam Bani, he was met with vocal opposition from the Sangat in Hamburg where he was scheduled to speak on stage at the local Gurdwara Sahib. 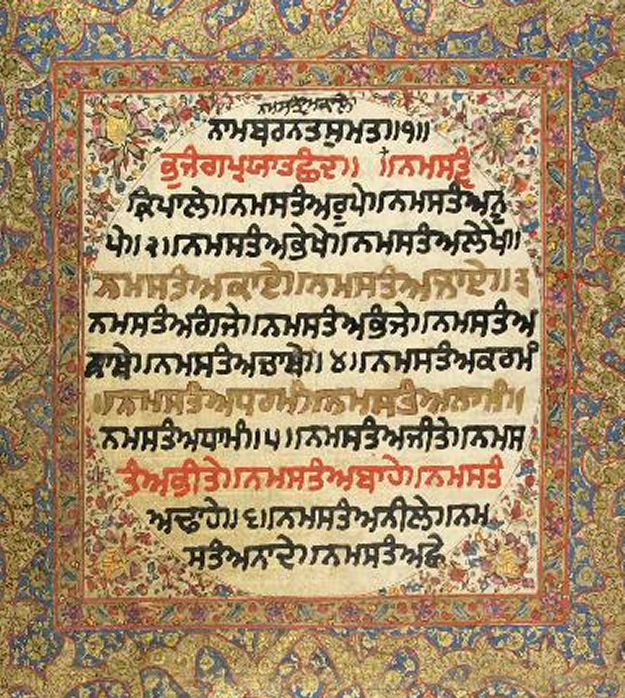 During a meeting held at Hamburg Gurdwara Sahib, the Ragi, in the words of his mentor, Kala-Afghana, alleged that there was no proof that any of the Nitnem banis were even read by Guru Gobind Singh Ji during the 1699 Baisakhi Amrit-Sanchar. Due to Sangat’s opposition, Darshan Sinh reluctantly agreed not to stir up any further controversy on Sri Dasam Granth Sahib until the 300th Gurta-Gaddi celebrations were concluded. The agreement was signed by the Ragi and the local committee members, it is being shown below for our readers' benefit. 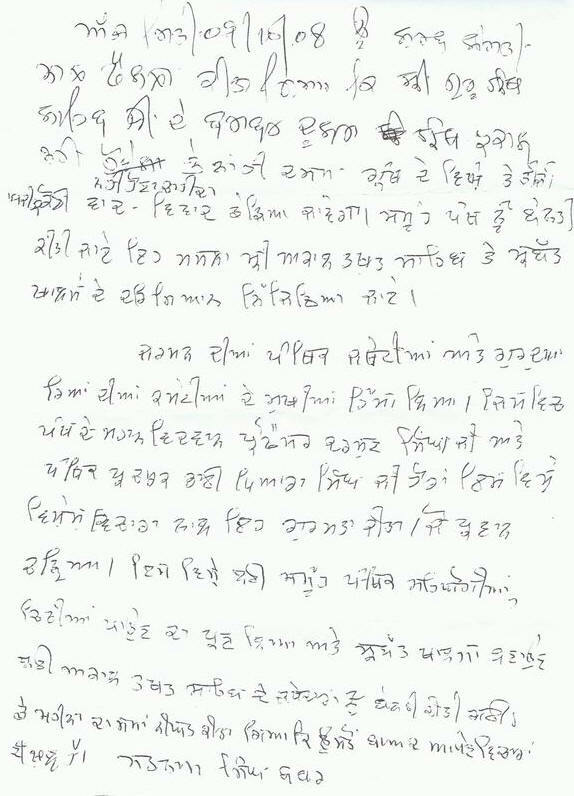 Although Sri Akal Takht Sahib directives already forbid any criticism of Sri Dasam Granth Sahib regardless of the Gurta-Gaddi celebrations, the Ragi quickly exposed his true face when only a day after this agreement, he went against his own words and went on a radio station in the UK where he restarted his anti-Sri Dasam Granth assaults. The shameless Ragi also went on record and issued a public statement in the Kala-Afghani mouthpiece, Rozana Spokesman, that all Sikhs should boycott the upcoming celebrations at Takht Sri Hazur Sahib, in Nanded, until Sri Dasam Granth is removed from the Takht. Sadly, several individuals claiming association with Germany’s Dal Khalsa, Babbar Khalsa and Akhand Kirtani Jatha were amongst those who showed sympathy towards Darshan Sinh’s views. When contacted by Panthic Weekly, representatives of various international units of Akhand Kirtani Jatha, including, Toronto, Canada, California, Sweden, Denmark, and France, were shocked that the organization’s name was being mis-represented by some self-serving European Sikh politicians as they were attempting to align themselves with anti-Sikh elements such as Darshan Sinh. 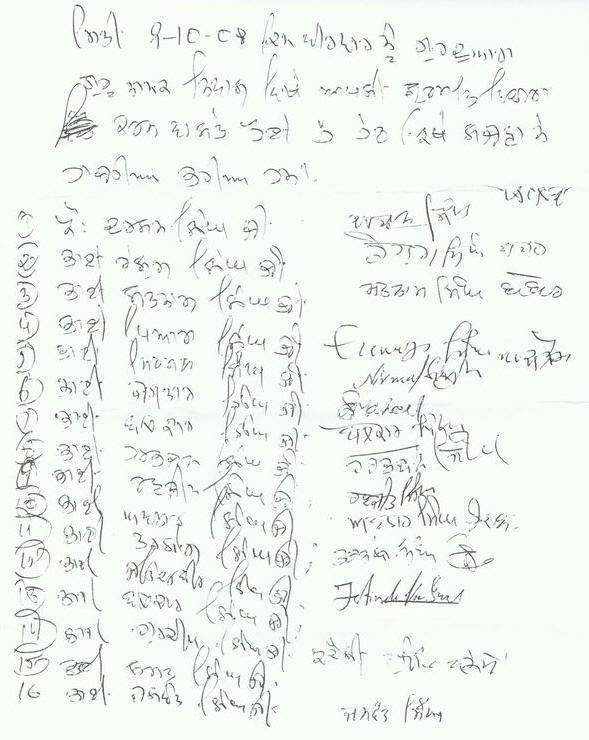 All different bodies of the Akhand Kirtani Jatha condemned not only Ragi Darshan Sinh but all those who offered their support to him in Germany and elsewhere. According to the representatives based in Toronto, who came down heavily on Ragi Darshan Sinh, "the Akhand Kirtani Jatha has led the fight against these nastics since the 1990’s, the Jatha initiated the challenge to the ragi at Takht Sri Damdama Sahib for an open debate with Panthic organizations, and he refused to show up for at the venue." The Ragi has tried to promote himself as a neutral individual while he has continued to spread venom against Sri Dasam Granth. Interestingly, he has tried to win the support of leaders belonging to Akhand Kirtani Jatha and other Panthic Organizations, whereas in the past, he labeled these organizations as being RSS subsidiaries. Several AKJ representatives hold close affiliation with the eleven member committee based in India, noted that that Jatha holds no sympathy towards the Ragi. They questioned, "Why would the Jatha now support him? He is an agent of the Indian Intelligence, and is doing exactly what they want: minimize the reverence of Sikh scriptures and divide and discredit Sikh organizations that are involved. Those who are assisting him cannot be associated with any Panthic organization." Positively, in Ireland and the UK, the local Sangat stood unified against him, and therefore not allowed to speak at Gurgwara Guru Nakak Darbar in Dublin, and Sri Guru Singh Sabha Southall, one of the largest Gurdwara Sahibs in Europe. "Loyal Panthic organizations... will always respect the Supreme Authority of Sri Akal Takht Sahib and the Khalsa Panth. This is what sets the Tat-Khalsa and the Malesh (pseudo) Khalsa, apart." It is becoming increasingly clear that the raagi is out to damage Sikh interests, philosophy and history. His agenda is now no different than the likes of Kala-Afghana and Joginder Sawney. Panthic Organizations need to continue to expose him and his ilk before those claiming to represent them continue to laud him and his beliefs. Panthic Weekly will continue to update you on his escapades in the coming weeks as it seems his current stay in southall may include more preaching against Sikhi and its core beliefs. Despite, the ongoing onslaught on the Sikh scriptures by such distractors and revisionists, our current and past history is replete of proof that loyal Panthic organizations, including the Nihang Dals, Singh Sabhas, Taksals, Semperdais, and Jathas will always respect the Supreme Authority of Sri Akal Takht Sahib and the Khalsa Panth. This is what sets the Tat-Khalsa and the Malesh (pseudo) Khalsa, apart.